A James Bond tribute band playing the themes from the film followed by a party set or a swing set. Welcome! We are a 10 piece James Bond tribute band based in the South West but we travel anywhere. If you have a themed wedding or event and want a fantastic Bond tribute band to play then you've come to the right place. 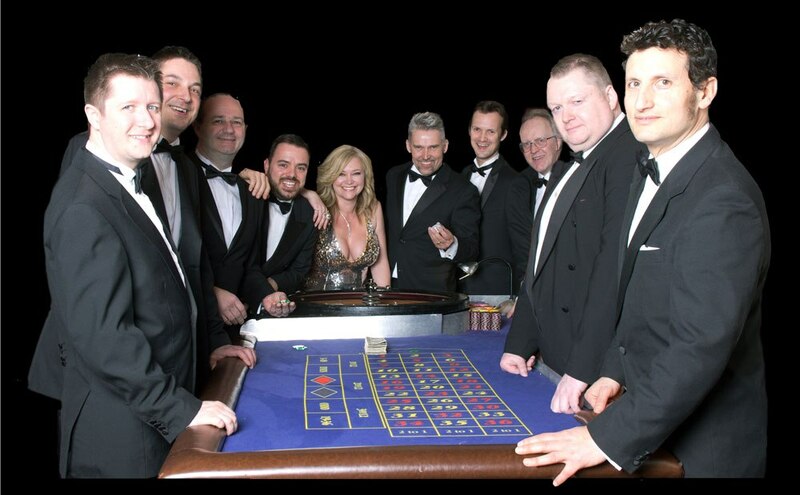 We are a highly experienced, entertaining and interactive band and play the James Bond themes for over an hour followed by either a full-on party set or a suave a sophisticated swing set. We adapt to suit your requirements. So we can play a 20 minute James Bond themed set as your guests arrive, take a short break and return for a further James Bond set. Then we change outfits and get the party started with music from the last five decades designed to keep your guests on that dancefloor all night long! Don't fancy a pop/party set? Then opt for our swing style set instead with music from the Frank Sinatra/Ella Fitzgerald era for a styled, sophisticated and impactive set. Our musicians are highly talented and adaptable. We ensure that our Bond set sounds as close to the originals as possible. We ensure our party sets are non-stop and we ensure our swing sets are perfectly executed. Our vocalists are adaptable and can sing most styles - more importantly they engage and interact with your guests so expect an entertaining and fun evening. Our brass section are superb too. We only ever play 100% live - so there are no backing tracks used - ever! We only ever play as a 10 piece band so you can be assured of the same, polished, professional performance each and every time. Available for weddings, charity events, parties, proms, themed events, product launches, festivals, anniversaries, celebrations of all kinds. Get in contact for a competitive and fairly priced quote for your event. Corporate Events. Weddings. Themed events. Charity fundraisers. Product launches. Proms. Casino events. Cinema screenings. Sporting events. Birthdays. Celebrations. Anniversaries. School events. Get quotes from The Name Is Band.....Bond Tribute Band and others within hours.